Slate and Enviroshake Roofing, Oakville, Toronto | Rooflines East Inc. 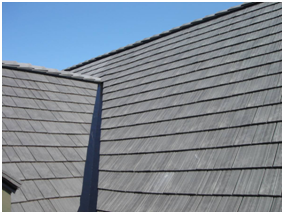 The Light-weight slate roofing, other-wise known as synthetic slate roofing, faux slate roofing, or composite slate roofing offers a realistic replication of natural slate and natural shake products without all of the demanding maintenance that comes with the real thing. Each composite tile is made with an advanced composite polymer blend with ‘UV’ inhibitors, blockers and absorbers. 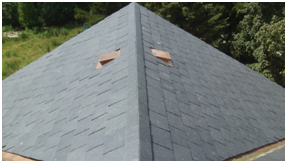 The synthetic slate roofing is great for re-roofs or homes which were not designed for a heavier roofing system like natural slate or concrete tile. Has the same authentic look as natural slate and concrete tiles. A lot easier to install because of its flexibility and weight. Less expensive the natural slate and concrete tiles. Eco-friendly!! Made from recycled materials. 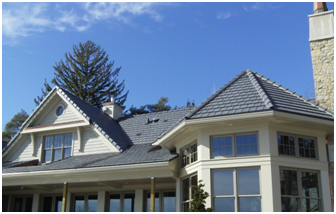 Enviroshake roofing is similar to the composite slate roofing – it is a composite shingle created to authentically replicate the look of a cedar shingle shake. It is made from 95% post-industrial recycled plastics, elastomers and cellulosic fiber. With 8 different profiles and custom molded ridge caps, the Enviroshake roofing product have unsurpassed durability, are not susceptible to mold, nor are they damaged from UV, and can even withstand wind speeds to 290Km/h. Lifetime warranty that is fully transferable & non-prorated. Will not rot, blister, peel, or crack. Mould, mildew, and insect resistant. Made from 95% recycled materials. Retains its value, giving the homeowner a 70-80% ROI. Since 1996 Roof Lines East Inc. has pioneered advances in the architectural metal industry installing custom copper, metal and zinc roofing. © 2017 Roof Lines East Inc.